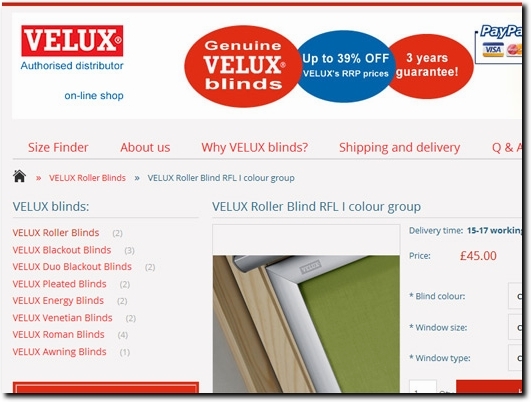 An online shop RoofBlindsOnline.co.uk offers an original accessories and blinds for VELUX windows. Regardless whether you’re looking for decorative solutions (cheapest VELUX roller blinds), you need total blackout (most popular VELUX blackout blinds) or you want to control temperature in the room (awning blinds), you will find something for yourself. Genuine VELUX blinds thanks to the narrow guides are elegant and discreet. Perfect fitting makes the installation of official VELUX blind so easy, that even people who aren' manually talented can handle it. 3 years of VELUX warranty – it’s the longest warranty for roof windows accessories on the market. Poland (Wroclaw) based business providing VELUX blinds for sale. Website includes e-commerce facilities, terms and conditions, delivery and returns information, testimonials, full contact details including VAT number.